Amazing views from Palace 2110! What a view! 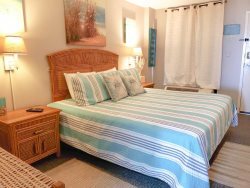 This 1 bedroom condo located at the Palace Resort is a great beach getaway for 2-4 guests. This unit offers a spacious living area with breathtaking views of the ocean! Beautifully updated, this apartment offers new tile flooring, fresh paint, new window treatments, new molding, new furniture and decor, and so much more! Our guests absolutely love the kitchen and the granite counter tops. The kitchen offers all full-size appliances including a dishwasher, stove, microwave, fridge, and even small appliances like a toaster and coffee maker. All basic kitchen necessities, cooking utensils, glassware, and cutlery are provided. This condo has a private bedroom, fully furnished with a queen bed. There is also a new queen sleeper sofa in the living room. Access the private balcony from both the living area and the bedroom! Coin operated washer/dryer is located on every other floor at The Palace. Please note: The Palace Resort is currently completing an exterior project that will take place until the end of April 2019. Our balcony is not complete and you will not have access to it and there could be noise and odors that affect your stay. Pools and amenities may also be affected. If given advance notice, we may be able to give you pool access to another place. We apologize for any inconvenience but because you are being forewarned, there will be no refunds given. Our prices are already marked low due to this. Guest Laundry Facilities: There is a laundry facility (coin machine operated) on the 16th floor that you are free to use.